ARCHITECTURE is the science and art of establishing structures where the part is in tune with the whole—the individual structure is in tune with its cosmic potential. This is the ideal of -Architecture—designing fortune-creating homes, cities, and nations from the level of the Cosmic architecture, the eternal design of the universe in accordance with the structuring dynamics of the field of Total Knowledge, the field of the science and technology of Total Natural Law, the Unified Field of all the Laws of Nature. The Global Country of World Peace offers the complete knowledge of Natural Law available in Maharishi Vedic Science and Technology, which has been brought out to the world by His Holiness Maharishi Mahesh Yogi over the past 50 years. The Global Country of World Peace offers this complete knowledge of Natural Law to each field of life, including Architecture, Building and City Planning, so that responsible leaders can take recourse to higher intelligence—the total Natural Law that peacefully administers the universe without a problem—to create a prevention-oriented and problem-free government, and national and international life filled with peace, good health, prosperity and fulfillment. In the field of Architecture, Building and City Planning, the Global Country of World Peace offers Maharishi Sthapatya Veda—Vedic architecture and city planning in accord with Natural Law—which designs buildings and cities so that they are properly oriented to Natural Law, with the entrances facing to enjoy the vital rays of the dawning sun, with proper proportions and layouts designed to make every building enliven the relationship between the intelligence of inhabitants of the structures and the Cosmic intelligence which administers the universe, maximizing the good fortune, health and happiness of everyone. It is not commonly known that the orientation (north, south east and west) of residential, governmental, educational and office buildings has a powerful influence on success and progress of their inhabitants, and on their health and happiness and fortune. A great deal of existing suffering and disease, and chaos and failure in business and government, can be prevented by using the Vedic principles of building according to the Laws of Nature. This structuring aspect of Vedic science, which is Nature’s own system of structuring, is the system of harmonizing individual life with Cosmic Life. This ancient Vedic wisdom ensures that structurally and functionally man’s creations are naturally in harmony with Nature’s creation—the creation of Natural Law. Every humanly designed, man-made structure should conform to the Natural Laws of structuring if that structure is to be in harmony with the structure of the universe which is the expression of Cosmic Intelligence. Such a structure has that quiet influence of order and harmony in its environment that harmonizes individual life with Cosmic Life. It saves the individual from being torn apart by disharmonious influences of the surroundings he has created—his house, his village, his city, etc. Through these principles the inner intelligence of the residents of a building is spontaneously in harmony with the Cosmic Intelligence of Nature that administers the universe, and individuals enjoy the support of Nature’s intelligence in all their activities. In this way each building contributes its maximum to support and fulfill every activity of those who live and work in it. The complete knowledge of how to build such buildings is available in Maharishi Sthapatya Veda design—Vedic architecture in harmony with Natural Law—that has been recently brought to light by Maharishi from the Vedic Literature. “People do not generally know that the orientation (north, south, east, west) of residential and office buildings contributes a great deal to success and progress in professional life; and health, happiness, and fortune on the individual level. Scientific studies confirm that wherever the entrance of a building is in the east, the residents enjoy better health, increasing prosperity, and harmonious relationships with others; but wherever houses are facing south or west, the opposite is the result. Scientific research has also shown that the brain physiology is highly sensitive to its directional orientation—the neurons of the thalamus fire differently according to the direction one is facing. This provides an understanding of how if one is in a building that is wrongly oriented, and one is consequently facing in improper directions as one works, studies, sleeps, eats, etc., this can have a powerful influence on the style of functioning of the whole body—a point that has been neglected in modern architecture to the detriment of the whole society. The general trend of governmental problems is greatly intensified by the influence of wrongly-oriented administrative buildings; and the unstable economy of every country is largely due to wrong orientation of buildings where economic activity is conducted. All these buildings were built long ago when the knowledge of proper orientation was not widely known in the world. Now that this knowledge is available to government, the time has come to begin the systematic reconstruction of government buildings, and the whole layout of the nation’s cities. Much of the chaotic performance of governments, instability of economy, and suffering caused by ill health, terrorism, conflicts, cruelty and crime will disappear if the activities are administered from buildings constructed according to Natural Law, and all the nation’s cities are reconstructed to provide proper orientation to all the buildings, and to the city as a whole. The Meissner Effect in physics verifies that a high level of inner coherence and harmony of a system expels disturbing influences. This explains how the order, harmony and good fortune generated by an ideal building constructed according to Natural Law disallow the penetration of any harmful, negative influence. When the whole city plan is laid out according to Natural Law, so that it has maximum inner coherence, then negative influences will have to remain outside the boundaries of the city—creating the ground for ideal, harmonious living conditions for the fortunate inhabitants of the city. • The industrial training and production buildings that are built according to Natural Law will provide that evolutionary quality of environment which will disallow stress to accumulate, and will enhance creativity and productivity. People need homes built in accord with Natural Law to gain the support of Natural Law and promote harmonious family life. Parents need schools, colleges and universities built according to Natural Law to bring the support of Natural Law to their children. Patients need hospitals built in accord with Natural Law to gain the support of Natural Law for fast and complete recovery. Executives and employees need office buildings and factories built in accord with Natural Law to gain the support of Natural Laws for unrestricted fulfilling success (for employers and employees). Mayors need Peace Palaces, garden cities and communities built in accord to Natural Law (free from crime, congestion, pollution and stress) to bring the support of Natural Law to the whole population. Administrators need administrative buildings built in accord with Natural Law to bring the support of Natural Law to government—for conflict-free politics. Heads of State, Governors, and national leaders need to redesign and rebuild the whole country according to Natural Law, to bring the support of Natural Law—health, wealth and happiness—to the whole population, generation after generation. When a nation utilizes Vedic architecture and city planning in accord with Natural Law to structure buildings and cities that maximize happiness, health and fortune, the government will be delighted to see that a peaceful, problem-free character is rising in the whole country. The government will find that not only has the quality of building and city design been transformed, but the whole character of national life is rising in peace and harmony with Natural Law, and other problems also are not appearing in national life. This will mean the government has achieved a new level of efficiency in administration, and fulfilled the ideal for every government—a prevention-oriented and problem-free administration. The ancient textbooks of Sthapatya Veda, a system of architecture and urban design, propose that specific elements in the design, construction, and siting of a building will have particular effects upon the quality of life of those persons occupying a building. The ancient texts propose in detail how influences may be designed into a building to promote such qualities as prosperity, happiness, health and enlightenment. And, the texts delineate the damaging influences of improper building design and construction which promote anger, fear and chronic disease. The objective of this system of design is to increase the influence of the beneficial factors from the built environment and eliminate the influence of the negative factors. Manasara and Maya Mata are the primary ancient Sanskrit texts that describe the total knowledge (Veda) of establishing form (Sthapatya). These texts apply to all created objects but are applied primarily to the fields of architecture and urban design. Vedic architecture is considered the oldest and most systematic of the world’s architectural traditions and is has been recognized as the original source of the East Asian geomancy system of Feng Shui1. The predictions in the ancient Vedic texts have been verified by the overwhelmingly positive subjective experiences of thousands of people world-wide who are living, studying or working in buildings designed within the past 17 years using the principles of Maharishi Vedic architecture. In North America alone about $400 million worth of these buildings have been built, and there have been many dramatically positive subjective reports by their users of improvements in well-being, physical health, family harmony, and financial success. Upon moving into my first Fortune-Creating home I noticed I slept more soundly without waking up during the night. My thinking was clearer, and I made better choices in business and in my personal life. When I had to temporarily move out was when I really noticed a contrast: my sleep became worse again. I had less support of nature and stayed up too late at night for no reason. The nurturing support, which Maharishi Sthapatya Veda design provides, was gone. To what degree have medical and scientific research verified and explained these remarkable predictions and personal experiences? Here, we summarize research conducted on Maharishi Vedic architecture. Some of the research has been published, some of it has been accepted for publication in a peer-review medical journal, and some of it is preliminary and not yet submitted for publication. Maharishi Sthapatya Veda theory predicts that our health is affected by our orientation while sleeping. It predicts that it is healthiest for us to sleep with our heads pointed to the east and most unhealthy to sleep with our heads to the north. In her study, she found the head direction correlated with mental health. she reported that planned comparisons [based on the ANOVA, a standard statistical analysis procedure] with direction of sleep as the grouping variable revealed that those individuals sleeping with their head pointing north had significantly lower scores on the Mental Health Inventory compared to patients who slept in other directions (F(1,150) = 9.08, p = .003). Thus, there is initial concrete evidence in support of Maharishi Sthapatya Veda design’s predicted effect of our sleeping orientation on mind-body health. Ongoing research includes evaluating brainwave and neuroendocrine patterns during different sleep orientation in humans. 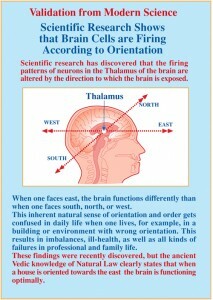 Also, research has begun to examine the brainwave patterns associated with head orientation and cardinal directions inside and outside a building with proper Vastu (see below). Sthapatya Veda also predicts that not only our own body’s orientation, but also the orientation of the buildings we occupy, will affect us in detectable, well-delineated ways. Maharishi Sthapatya Veda theory predicts that the widest range of auspicious influences benefit those who live in east-facing houses, and the broadest, most life-damaging influences come to bear on those in south-facing houses. The texts state that enlightenment, affluence and fulfillment will increase to those who live in east-facing houses and that all negative influences – problems and suffering – will affect the lives of those who live in south-facing houses.7 Though we do not yet have a bio-mechanical model to explain this predicted effect, we can nonetheless test to see whether it does occur. 1. Mental Health: The first such test was carried out as a component of Dr. Butler’s research cited above. As a part of her survey of patients Butler discovered that there was a strong correlation between house orientation and scores in the areas of mental health and prosperity among her patients. Significantly lower scores were found in these areas among patients whose homes faced south. Specifically, she found that patients whose homes had south entrances had significantly poorer overall scores on the Mental Health Inventory than patients with north or east entrances (F(1,154) = 4.51, p = .035)….Patients whose homes had south entrances also reported more financial problems relative to those with north or east entrances (F(1,154) = 4.18, p = .043). This result remained significant even when controlling for level of income (F(1,153) = 3.98, p = .048). Each of these individual cited studies is preliminary, but taken collectively they lend support for the principle of Maharishi Vedic architecture that mind-body health and wellbeing is promoted by the design of east-facing buildings, and designs that provide a maximum of eastern sunlight for their occupants. Maharishi Vedic architecture is considered by its practitioners to be a holistic science. When multiple predictors are present the effects are anticipated to be stronger. A study is underway to examine this prediction.11 In this study 100 publicly-owned businesses have been selected randomly in the Faroe Islands, a territory of Denmark. Five years of financial records for each company has been compiled from public records, as have aerial photos, topographic maps, and site plans of their headquarters. Companies have been excluded from the study if their income is not generated within their headquarters – fishing and shipping companies, for example, have therefore been excluded. The consultant has begun to grade each company according to the predicted influence of each of the five factors and is compiling a single numerical predictor for their overall influence, and is then ranking the companies on the basis of this predictor. Independently, the study’s lead researcher, a professor of business and statistics, is ranking the financial success of the companies on the basis of the amount of profit generated per employee over the five year period and other standard financial statistics. In a preliminary review of the data, results for thirty of the companies have been compared, and in the cases of 27 out of the 30 companies the researchers report that the Vedic architecture indices correlated with the amount of profit generated per employee by the companies. 27 out of 30 is a remarkably high correlation. The researchers plan to submit the study for publication in a peer-reviewed journal when they have completed their analysis of all of the 100 companies. We encourage future research to clarify the effects of these ancient principles by studying either individual principles or combinations of principles. 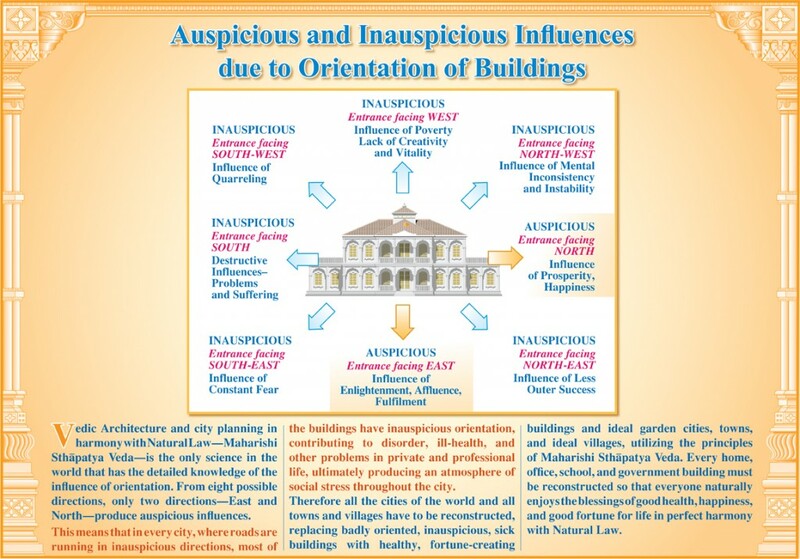 Also, research can be conducted to examine the effects of the many hundreds of buildings built world-wide over the past decade entirely according to the recommended principles of Maharishi Vedic architecture. It is proposed that even more measurable effects upon occupants’ well being and success will be found in them, in accordance with anecdotal evidence and the preliminary research findings. We encourage the national research institutes, such as the NIH, to examine these principles of Vastu and the great potential they offer to the health and welfare of the world. 1 This statement is based upon conversations with masters of Feng Shui and Sthapatya Veda by Lipman. We recommend further research by an historian of Asian architectural. 2 Maharishi Vedic, Maharishi Sthāpatya Veda and Maharishi Vastu are registered or common law trademarks licensed to Maharishi Vedic Education Development Corporation and used under sublicense or with permission. 3 Financial calculation and anecdotal experiences of building users collected by Eloise Raymond and Susan Lauer for Fortune-Creating Buildings/1680 Highway One, Suite 2600/Fairfield, Iowa, 52556/USA (info@fortunecreatingbuildings.com). A large selection of first-person experiences, including the one quoted above, may be reviewed at http://www.fortunecreatingbuildings.com/testimonials. 4 Building for the Health and Happiness of Everyone, Creating Ideal Housing in Harmony with Natural Law – Exhibition, Maharishi Vedic University, The Netherlands, 1998. Page 3. Available from Fortune-Creating Buildings/1680 Highway One, Suite 2600/Fairfield, Iowa, 52556/USA (info@fortunecreatingbuildings.com). 6 Travis, F., Butler, V., Rainforth, M., Alexander, C.N., Khare, R., Lipman, J. “Can a Building’s Orientation Affect the Quality of Life of the People Within? Testing Principles of Maharishi Sthāpatya Veda,’’ Journal of Social Behavior and Personality. October, 2004. Butler’s study’s subjects did not live in Maharishi Sthapatya Veda-designed houses and were generally unacquainted with Maharishi Sthapatya Veda design. Approximately 100 subjects were included in the study. 7 Building for…, page 13. 8 John Zamarra, M.D., verbal description of preliminary review conducted by on 100 of his recent patients. Orientation of house was based on street address. Addresses were categorized into one of four cardinal directions. Zamarra hopes to follow this up with a comprehensive study of 3000 patients and submit his findings for publication. 10 Prev. cit. : Travis, F., Butler, V., Rainforth, M., Alexander, C.N., Khare, R., Lipman, J., Study conducted on 110 burglaries reported in Fairfield, Iowa. A preliminary, unpublished study in 2000 by student Jar-El Cohen at the Maharishi School of the Age of Enlightenment, Fairfield, Iowa conducted on burglaries reported in Ottumwa, Iowa yielded similar results. 11 Lead researcher is Olavur Christiansen, Ph. D., University of the Faroe Islands, Denmark. This report is based upon an oral presentation made by Christiansen in August of 2001 to the faculty of the business school at Maharishi University of Management, Fairfield, Iowa. 19 Arenander, A, Travis, T. and Wallace K. working at MERU in Netherlands, 2005.